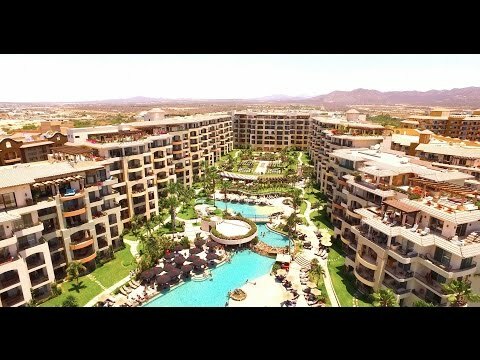 Top of the line resort of The Villa Group in Los Cabos. Room Amenities: Each 481 sq. ft. room provides two queen beds, one bathroom, mini-bar, furnished terrace and coffee maker. Note: Hotel offers Room Only and Full Board Plan options, please check your desired travel dates to get specific rates. Once per booking and require a minimum stay of three nights. Valid on surcharged menu items, premium beverages and bottles of wine, select regular-price spa services, wireless Internet access, laundry and dry cleaning service, and in-room telephone calls and the Kids Club. May not be used at the Delicatessen, Palmita Market, or applied toward room service delivery fees and the in-room mini-bar. Gratuities are not included. The credit will be applied to the final statement upon check-out. Any unused portion of the credit is nontransferable, non-refundable and may not be redeemed for cash. Valid for travel Now - January 2, 2020. Room Amenities: One king bed in the master bedroom, one queen sleeper sofa in the living room, two bathrooms, one Jacuzzi in the master bathroom, fully equipped kitchen, dining living room, furnished balcony and internet access. The bathroom features a spacious walk-in travertine marble showers, twin lavatories and whirlpool tubs in master baths, walk-in closets with maple cabinetry, and travertine marble floors. The kitchen features granite counter-tops, double door, 24 cubic foot refrigerator, range, oven, microwave oven, dishwasher, garbage disposal and breakfast bar, and laundry room with full size washer and dryer and large pantry. Other features of the villa include hacienda style private entryways with solid maple wood finishes and decorative styling, 10` ceilings with ceiling fans in all bedrooms, living and dining areas, zoned central heating and air conditioning system, state of the art television, stereo, compact disc entertainment systems, in-suite high speed internet access and pool side wireless access, wet bar on private patio terraces. Average size of the One Bedroom Villas is 1,730 square feet. Note: Hotel offers Room Only and Gourmet Privilege Plan options, please check your desired travel dates to get specific rates. Unlimited Dining at Any of the Resort`s Restaurants, Including those of Sister Resorts Villa del Arco and Villa del Palmar, Up to Nine Restaurants Total. Includes Water, Soft Drinks, Coffee and Tea [Alcoholic beverages are not included]. Room Amenities: One king bed in the master bedroom, one queen bed in the second bedroom, one queen sleeper sofa in the living room, three bathrooms, one Jacuzzi in the master bathroom, fully equipped kitchen, dining living room, mini-bar on the terrace, furnished balcony and internet access. Other features of this villa include hacienda style private entryways with solid maple wood finishes and decorative styling, 10` ceilings with ceiling fans in all bedrooms, living and dining areas, zoned central heating and air conditioning system, state of the art television, stereo, compact disc entertainment systems, in-suite high speed internet access and pool side wireless access and a wet bar on private patio terraces. Bathroom features include a spacious walk-in travertine marble showers, twin lavatories and whirlpool tubs in master baths, walk-in closets with maple cabinetry and travertine marble floors. Kitchen features include a granite counter-tops, double door, 24 cubic foot refrigerator, range, oven, microwave oven, dishwasher, garbage disposal and breakfast bar, and laundry room with full size washer and dryer and large pantry. Average size of the Two Bedroom Villas is 2,212 square feet. Located on Medano Beach in Cabo San Lucas, only 2.5 Km from downtown Cabo San Lucas and 45 km from the San Jose del Cabo International airport. Villa La Estancia Resort and Spa will surround you with the pleasures of paradise that extend far beyond the luxuries of your secluded villa. The resort offers the perfect blend of exclusive luxury accommodations, location, and recreational activities. Just steps from your room, the beaches of Medano are some of the safest swimming beaches in the Los Cabos area. Although smoking is not permitted within the suites, Guests who smoke are permitted to do so outside on their room balconies and/or other designated areas. Alcoholic Beverages, Palmita Market Products, Ice Cream Shop, Phone Calls, Spa, Childcare, Ground Transportation and Laundry are not Included. The newly added bonus is that all villas offer luxury bath amenities with L`Occitane and soaps, shampoos, gels and lotions. Relax on the white sandy beach on the sapphire blue waters of the Sea of Cortez with unobstructed views of Los Cabos` famed `El Arco` landmark where attendants cater to your every need. Indulge you senses at neighboring resort Villa del Arco`s famed European style spa, enjoy a leisurely day by the infinity pools, or take a water taxi to idyllic dining and dancing locals. Explore the enchantment of Los Cabos, partake in a day of golf or horseback riding, or any of the on-site activities. La Estancia offers everything from a fully equipped gym, private tennis courts, in-suite spa services, to fine dining.